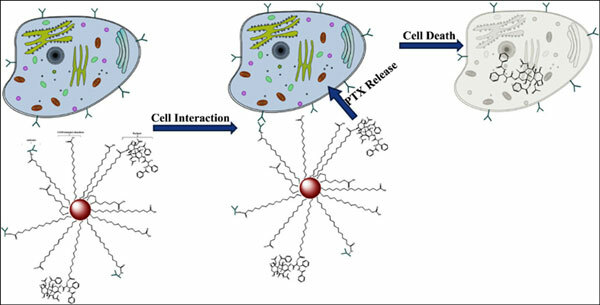 Background and Objective: Gold nanoparticles (AuNP) conjugated with either EpCAM or TARP antibodies and an anticancer agent, paclitaxel (PTX), for tumour targeting and therapy were synthesised using a simple chemistry. Methods: The AuNP surface was functionalised using a two-step modification approach. The conjugates were characterised using Transmission Electron Microscopy (TEM) and infrared spectroscopy. Results: The cytotoxicity assay of T47D cells treated with only antibodies conjugated to the gold nanoparticles did not show any cytotoxicity to the cells, which indicates these nanoconjugates are suitable for intracellular delivery of anticancer drugs. Conclusion: When using AuNPs with antibodies and the cancer chemotherapy agent PTX attached simultaneously to the functionalised AuNPs, the reduction of cell viability was significantly higher compared to PTX-thiol-AuNPs conjugate system where no antibodies were used. Gold nanoparticles, paclitaxel, EpCAM, TARP, antibodies, cytotoxicity, drug delivery.